Presidential candidate Jovenel Moise from the PHTK political party waves to supporters as he arrives to a press conference in Port-au-Prince, Haiti, Nov. 5, 2015. A banana plantation owner and the former head of Haiti's government construction agency will face off against each other in Haiti's presidential runoff next month. Haiti's Provisional Electoral Council announced late Thursday that 37-year-old banana entrepreneur Jovenel Moise of the ruling Haitian Party of Bald Heads - named in honor of the outgoing president - received 32.8 percent of the vote in the October poll, while 53-year-old Jude Celestin of the Alternative League for Progress and Emancipation of Haiti received 25.2 percent. More than 50 candidates were running for Haiti's top office. Election observers said the vote was largely free of major problems and the violence that had plagued parliamentary elections in August. 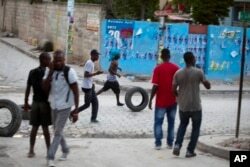 Officials say only 1.5 million of Haiti's more than five million registered voters took part in the election. Supporters of presidential candidate Moise Jean-Charles move tires before burning them during protests against official results just announced by the Electoral Council in the neighborhood of Delmas 33, Port-au-Prince, Haiti, Nov. 5, 2015. October's election was staged nearly five years after President Michel Martelly came to power in a country struggling to recover from the effects of the deadly 2010 earthquake that leveled much of the capital, Port-au-Prince, and left more than a million people homeless. Today, some hard-hit sites in Port-au-Prince have changed dramatically and most lots are cleared of rubble. However, thousands of people are still struggling to eke out a living.